An absolutely astonishing , a simply miraculous event happened yesterday. 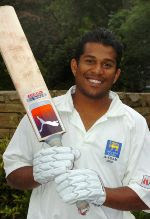 we had the 25 yr old Sri lankan A player Dhanuka Parinitha Score a swashbuckling knock of 277 runs in just 72 balls marked by 29 huge sixes and 18 fours in a twenty20 game match that took place in london. The youngster describes his breathtaking knock as a dream. With the twenty20 world cup nearing this fantastic, out of the world unimaginable knock of his would add a lot curiousity to this short fast paced, exciting version of cricket.